In this research, the continuously operated laboratory scale Kaldnes (k1) moving bed biofilm reactors (MBBRs) under partial nitrification-denitrification process were used for treatment of synthetic wastewater containing ammonium and glucose. The Anoxic and Aerobic reactors were filled to 40 and 50 %( v/v) to attach and retain biomass with k1 biofilm carriers, respectively. The favorite internal recycle ratio and hydraulic residence time (HRT) to eliminate nitrogen compounds were 300% of inflow rate and 20 hours, respectively. Optimal dissolved oxygen (DO) was 1-1.5 mg/L in the aerobic reactor. No sludge was returned into the system and only an internal recycling was performed from aerobic to anoxic reactor. 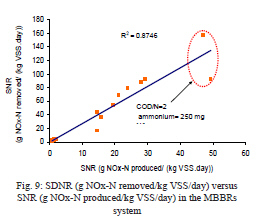 The results showed that the maximum and average specific nitrification rate (SNR) in the aerobic reactor were 49.4 and 16.6 g NOx-N/KgVSS.day, respectively and the maximum and average specific denitrification rate (SDNR) as 156.8 and 40.1gNOx-N/KgVSS.day in the anoxic reactor, respectively. The results also showed that it is possible to reach a stable partial nitrification with high ratio of NO2-N/NOx-N (80% to 85%) during high load ammonium and low DO concentration (<1.5 mg/L) in the aerobic reactor. During optimum conditions, the average removal efficiency of total nitrogen (TN), ammonia and soluble organic carbon (SCOD) occurred as 98.23%, 99.75% and 99.4%, respectively. This study showed that the partial nitrification/denitrification process in the moving bed biofilm reactors system has an acceptable performance for treatment of wastewater with high load of organic carbon and organic nitrogen compounds. One of the important problems in modern wastewater treatment systems is ammonium removal. Biological Nutrients Removal (BNR) in both domestic and industrial wastewater treatments, generally seems increasingly necessary (Wang and Yang, 2004). Nitrogen compounds are usually removed from wastewater by a combination of two processes of nitrification and denitrification. In nitrification, ammonia is oxidized to nitrite and nitrate by two different groups of microorganisms. The first group of microorganisms, ammonia oxidizing bacteria (AOB), converts ammonia to nitrite and after that, the second group, nitrite oxidizing bacteria (NOB) oxidizes the intermediate product to nitrate. In the denitrification process, nitrate is first converted to nitrite (NO2-) and then to nitrous oxide or laughing gas (N2O), nitric oxide (NO), and finally to nitrogen gas(N2) (Wang and Yang, 2004). Usually, nitrite oxidation proceeds faster than ammonia oxidation, so that nitrite rarely increases in the environment. This is very likely due to a minimum substrate concentration capable of steady state biomass and relatively high substrate uptake rate of the nitrite oxidizers (Rittmann and McCarty, 2001). If the nitrite oxidation could be controlled, an important advantage can be taken in nitrogen removal by using a shortcut biological nitrogen removal process or partial nitrification (PN). Shortcut biological nitrogen removal is a technology that oxidizes ammonia to nitrite and reduces nitrite to nitrogen gas (Turk and Mavinic, 1987; Chung and Bae, 2002). New processes such as nitrification/denitrification have been developed through nitrite accumulation (Ruiz et al., 2003; Ruiz et al., 2006). This process is based on the fact that, since nitrite and nitrate are intermediary compounds in both processes (nitrification/denitrification), a PN to nitrite and a denitrification from this nitrite, instead of nitrate, would be suitable. This approach will produce saving in oxygen demands during nitrification, a reduction of the organic matter requirements in the denitrification process, in addition to, a decrease in extra sludge production (Chung and Bae, 2002). Denitrification rates with nitrite are usually1.5-2 times faster than with nitrate (Abeling and Seyfried, 1992). For these reasons, PN to nitrite may be attractive. Nitrite accumulation studies have been performed focused on several factors, such as free ammonia concentration by exploit pH or temperature, dissolved oxygen concentration and heterotrophic nitrification (Bernet et al., 2001; Antilo et al., 2006). The first moving bed biofilm reactor (MBBR) facility became operational in early 1990 in Norway and then was developed in Europe and United State of America. In 2000, there have been more than 400 large-scale wastewater treatment plants based on this process in operation in 22 different countries all over the word (Maurer et al., 2000) and many MBBR plants are in operation at commercial fish farms. The MBBR process is based on the biofilm principle that take advantage of both activated sludge process and conventional fixed film systems without theirs disadvantages. Reactor can be operated at very high load and the process is insensitive to load variations and other distributances (Odegaard et al., 1994; Delenfort and Thulin, 1997). Unlike most biofilm reactors, the reactor volume in the MBBR is totally mixed and consequently there is no dead or unused space in the reactor. In addition, this system has a small head loss and no need for recycling of biomass or sludge [Xiao et al., 2007). The bioﬁlm carriers (Kaldnes1), made from high-density polyethylene or polypropylene, have a large surface area and a density slightly less or heavier than 1.0*103 kg/m3; the length (mm), diameter (mm) and protected area (m2/m3) of biofilm carriers are 7, 10 and 500, respectively (Odegaard et al., 1994; Delenfort and Thulin, 1997). An important advantage of MBBR is that the filling fraction of biofilm carriers in the reactor may be subject to preferences. In order to be able to move the carrier suspension freely, it is recommended that filling fractions should be below 70% (Rusten et al., 2006). The objective of this research was to evaluate the organic and nitrogen removal by applying a lab-scale partial nitrification/denitrification process (pre-denitrification) without return sludge in MBBR system, continuously operated and filled with Kaldnes (k1). The experiments were conducted using two Plexiglas laboratory scale MBBRs in series, including an anoxic reactor (R1) (diameter =14 cm, effective height=30 cm and reaction volume = 3.5 L), an aerobic reactor (R2) (length=30 cm, effective height=27 cm, width=15 cm and reaction volume =10 L) followed by a final clarifier. No sludge recycling was implemented. R1 was used to study the denitrifying bacteria in denitrification utilizing nitrite and nitrate as electron acceptors and R2 was built to provide nitrification. Aerobic reactor was aerated using air stones connected to air compressor. The temperature was controlled by water-bath at 28.5 ± 1 °C, and pH was manually regulated in the range of 7 - 8 by adding 1 M NaHCO3 during the period of start-up of the MBBRs system. Internal recycle (IR) ratio from aerobic reactor to anoxic reactor was kept at 3× flow rate, since it has been reported as the optimal IR ratio for nitrification/denitrification process (Tchobanoglous et al., 2003). During the start-up stage, the hydraulic retention time (HRT) was decreased from 48 to 8 h. Complete mixing was ensured by means of a central, 2-blade double stirrer of 12-cm diameter and with blades placed at 5 and 12 cm below top-water level; the stirrer speed was 60 and 30 rpm in the anoxic and aerobic reactors, respectively. Reactors were operated in an up-flow mode. Sampling ports were provided in each reactor for sample collection. Synthetic wastewater and internal recycle were continuously fed into the bioreactors using variable speed pumps (Italian ETATRON DS model DLS-MA). A sketch of the lab-scale MBBRs is shown in Fig. 1 and the key parameters are listed in Table 1. Characteristics of the Kaldnes (k1) media and filling grade of reactors are presented in Table 2. The Kaldnes carrier elements are made of polyethylene (density 0.95 g/cm3) and shaped like small cylinders (about 10 mm in diameter) with a cross inside. The effective speciﬁc growth area is 500 m2/m3 at 100% ﬁlling grade (Odegaard et al., 1994).The ﬁlling grade of anoxic and aerobic reactors were 40% and 50%, respectively. The pilot plant was operated in pre-denitriﬁcation mode with the anoxic preceding the aerated. The study was carried out using synthetic wastewater comprising glucose as the main organic constituent, plus balanced macro and micro-nutrients and alkalinity. The wastewater was enriched with macro-nutrients by adding NH4HCO3 as nitrogen source and KH2PO4 and K2HPO4 as phosphorus sources. The micro-nutrients were added to correct growth conditions for microorganisms according to Hem et al., 1994; Strous et al., 1998; Dulkadiroglu et al., 2005. 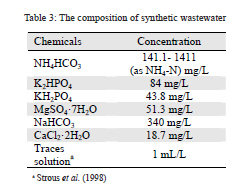 Detailed of the synthetic wastewater composition are given in Table 3. Seeding sludge was obtained from Isfahan Municipal Wastewater Treatment Plant. Prior to the experimental phase, the carrier elements were acclimated for at least four weeks in the batch reactors to allow biofilm development. After that the system was continuously operated without external carbon source. The composition of ingredients in synthetic wastewater was chosen in a way that COD, NH4-N and orthophosphate phosphorus (PO4-P) concentrations of 300-2000 mg/L, 25-250 mg/L and 5-50 mg/L, respectively were prepared and used as feed to the system. Samples were collected from influent and sampling ports of each reactor. Temperature, dissolved oxygen (DO) and pH were measured in each reactor twice a day, immediately before sampling, and were controlled manually. DO concentrations and pH were measured with an oxygen electrode (YSI-55, YSI company) and pH meter model CG-824, respectively. The samples were analysed immediately after being filtered through 0.45 µm filter paper. Soluble COD, ammonium (NH4-N), nitrate (NO3-N) and nitrite (NO2-N) are measured in accordance to Standard Methods (APHA, 2005). All measurements were made in duplicate. Where NO2 in and NO3 in are NO2−–N and NO3−–N concentrations (mg/L) in the influent, NO2−out and NO3−out are NO2−–N and NO3−–N concentrations (mg/L) in the effluent, Q (L/day) is the flow rate, and A (m2) is the surface area of the media. The soluble COD removal efficiency variation profile in the total system and at different reactors of MBBRs is shown in Figs. 2 and 3. The results showed that under the conditions of COD = 500 mg/L, NH4+-N=35.7 mg-N/L, PO4-P = 7.14 mg-P/L, HRT=20h, IR=3:1 and DO=1-1.5 mg/L, the removal efficiency of filtered COD was up to 99%. 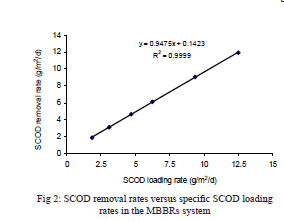 Based on the average incoming soluble COD (SCOD) loading rate of 6.30 g/m2d, the removal rate was between 1.87 and 11.96 g/m2d with the average of 6.11 g/m2d (SD = 3.79) for MBBRs system. As seen from the results, the average SCOD removal efficiency for the total MBBRs system was 99.4%. 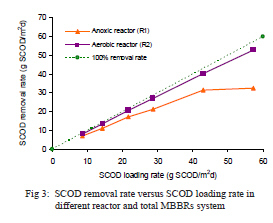 According to the results of statistical analysis for SCOD removal rate (under condition of partial nitrification and pre-denitrification) at different loading rates, a strong correlation to the SCOD loading rate in the MBBRs system was observed (R2=0.999) and it could be assumed that there exists a relationship between SCOD removal rate and all SCOD loading rates (p <0.01). The efficiency of each reactor did not significantly decreased with increasing the loading rate of SCOD to 1000 mg/L (5.06 g/m2d). Efficiency reduction in R1 in the loading rate of 2000 mg/L was more visible. Most of the COD in the influent was used to reduce NOX (denitrification) in R1 and the remaining COD was removed in R2 by a combination of denitrification and aerobic oxidation. 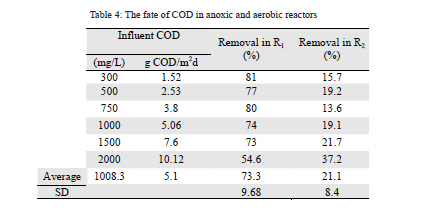 13.6–37.2% of the SCOD was removed in the aerobic reactor, while 55–81% was removed in the anoxic reactor (Table 4 and Fig.4). According to Table 4 and Fig. 4, the removal efficiency were between 55% and 81% with the average of 73% (SD = 9.7) for reactor 1, and between 14% and 37% with the average of 21% (SD =8.4) for R2, respectively. The results of the average effluent SCOD concentration from each reactor showed that denitrification process in the anoxic reactor, preceding the aerobic reactor in pre-denitrification system, consumed most of the biodegradable organic matter. Thus, in the aerobic reactor the average biodegradable filtered COD (SCOD) load was considerably lower and did not interfere with the nitrification. The effect of dissolved oxygen concentration versus ammonium loading rate was studied in detail in the aerobic reactor by manipulating the air valve of the compressor and thereby the dissolved oxygen concentration in the reactor (Fig. 5). In this experiment dissolved oxygen concentrations in R2 ranged from 0.5 to 3.3 mg/L. The results demonstrated that when the DO concentration in the reactor (R2) exceeded 2.5 mg/L, ammonia was fully converted to nitrate and ammonia conversion was limited by the incoming ammonia load into the reactor. Specific Nitrification rates (SNR) per biofilm surface versus specific ammonium loading rate (SALR) on MBBRs system during pre-denitrification, without recycling sludge, without external carbon source and continuously operation are shown in Fig. 6. The data have been calculated based on lab-scale influent and effluent NH4-N concentrations and the biofilm surface area in the aerated reactor. Based on the ammonium loading rate (0.1-4.43 g-N/m2d), the removal rate was between 0.09 and 2.98 g-N/m2d with the average of 0.66 g-N/m2d (SD = 0.93) for R2. The results of continuous experiment are shown in Fig. 7. During the start-up period, the reactor was operated at a low ammonium loading rate (25 mg-N/L) at a ﬁxed HRT of 20h. DO concentration was controlled at the range1-1.5 mg/L in the aerobic reactor limiting the oxygen concentration to prevent nitrate production. Ammonium removal gradually increased with the same DO, indicating the occurrence of nitriﬁcation in the system and the growth of nitrifying bacteria. At the same conditions inﬂuent ammonium was then gradually increased to 250 mg-N/L after ammonium removal efficiency reached around 93%. As shown in Fig. 7 the maximum and average influent NH4+-N concentration in the aerobic reactor based on the biofilm surface area was 4.43 and 0.889 g NH4-N/m2day and the maximum and average removal rate was 2.98 and 0.657 g NH4-N/m2day, respectively. Fig. 8, show the denitrification rates versus NOx-N loads (NOx-N=NO2-N+NO3-N) in the anoxic reactor at three internal recycle ratios between aerobic reactor and anoxic reactor. DO concentration for partial nitrification was set at 1-1.5 and 0.04- 0.07 mg O2/L in R2 and R1, respectively. The data have been calculated based on lab-scale influent and effluent NOx-N concentrations and the biofilm surface area in the anoxic reactor. As indicated, the denitrification rate has increased with increasing NOx-N loading. As shown in Fig. 8, the maximum denitrification rate was 1.86 g NOx-N removed per m2 per day (SD = 0.64). 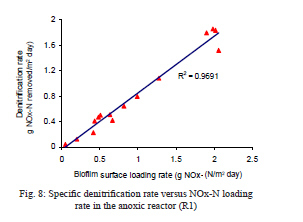 The relationship of denitrification rates versus NOx-N loading in the anoxic reactor was linearly fitted, resulting in high correlation coefficient of R2= 0.97 in all cases. Fig. 9 shows that the maximum and average SNR in the aerobic rector was 49.4 and 16.6 g NOx-N/kg VSS/day (38.42 and 14.442 g NOx-N/kg TSS/day), respectively (SD = 15.85); whereas the maximum and average specific denitrification rate (SDNR) in the anoxic rector was 156.8 and 40.1g NOx-N/kg VSS/day (127 and 32.48 g NOx-N/kg TSS/day), respectively. As indicated, the denitrification rate has increased with increasing NOx-N loading rate. Fig. 10 and 11 show that the relationship between the nitrification and denitrification (removal efficiency percentage) and NO2-N/NOx-N (%) versus the total nitrogen (TN) loading rate in the anoxic (R1) and aerobic reactor (R2) without external carbon source and returned sludge in MBBRs system. In the anoxic reactor, nitrite accumulated with little nitrate present (nitrite accumulated ratios 73%-100% and average by 93.6%) when TN was from 25 to 250 mg/L in anoxic reactor. Fig. 11 shows the ratio of nitrite to total nitrogenous oxide (NOx-N=NO2-N+NO3-N or the nitrite-accumulation rate) versus TN in the aerobic reactor. Based on the results, nitrite accumulated ratios under the operational conditions (HRT=20h, IR=3Q, DO=1-1.5 mg/L and T=28.5±1oC) and different nitrogen loading rates were between 18% and 83% with the average of 52% (SD =20.27) for aerobic reactor and between 73% and 100% with the average of 94% (SD =7.3) for reactor anoxic. According to the results, the ratio of nitrite to total nitrogenous oxide had a strong correlation to total nitrogen loading rate in the aerobic reactor under low DO concentration= 1-1.5 mg/L (R2=0.76). This results showed that there was significant (p-level<0.05) correlation between the ratio of nitrite to total nitrogenous oxide and total nitrogen loading rate. 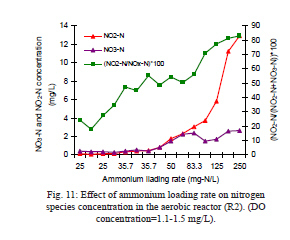 This indicated that the nitrite accumulation in the aerobic reactor followed the nitrogen loading rate as the ratio of NO2-N/NOx-N (%) was achieved above 80% at ammonium loading rate of 250 mg-N/L. As indicated, the nitrite accumulation rate in the aerobic reactor has increased with increasing TN loading rate at DO concentrations lower than 1.5 mg/L. The average TN effluent during the operational conditions was 3.5±1 mg-N/L in the aerobic reactor. Fig. 12 showed that the lab-scale MBBRs system under partial nitrification/ denitrification process has acceptable SCOD, NH4-N and TN removal efficiency up to 99.4%, 99.75% and 98.24%, respectively. In this research an experimental study to evaluate the application of partial nitrification/denitrification process in the MBBR system for the organic carbon and nitrogen removal from wastewater is described. Rusten et al. (1995) reported that degradation of organic matter will slow down or stop the nitrification process. Heterotrophs and nitrifiers will compete for available oxygen and the rapidly growing heterotrophs will dilute (or wash out) the nitrifiers in the biofilm. Jahren et al. (2002) reported that an average SCOD were removed by 90-95%. 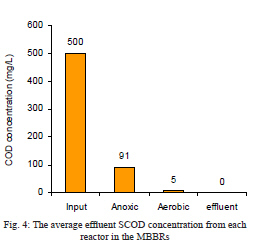 The results of the average effluent SCOD concentration from each reactor showed that the MBBRs system has high ability to remove high COD concentrations under low DO concentrations in aerobic reactor. Based on the experimental results, the results of the average effluent soluble COD concentration from each reactor showed that denitrification process in the anoxic reactor consumed most of the biodegradable organic matter. Some new processes such as shortcut to biological nitrogen removal are based on the fact that nitrite is an intermediary compound in both steps of nitrification and denitrification. This approach will produce savings in the oxygen needs during nitrification, a reduction in denitrification organic matter requirements, plus a decrease in surplus sludge production. Partial nitrification requires the reduction of the activity of nitrite oxidizing bacteria, without affecting ammonia oxidizing microorganisms (Ciudada et al. 2005). Because DO is the co-substrate for nitrification, its concentration influences the reaction rate of both ammonia and nitrite oxidation. In other words, effluent ammonium concentration was decreased when DO concentration was decreased in the aerobic reactor. It is generally known that DO concentration above 1 mg/L is essential for nitriﬁcation; if the DO level is lower, oxygen becomes the limiting factor and nitriﬁcation slows or ceases. On the contrary in denitriﬁcation, high DO levels will suppress the necessary enzyme systems. Thus, when partial nitrification-denitrification via nitrite becomes dominant, controlling the DO level is critical to balance the degrees of nitriﬁcation and denitriﬁcation, and the resulting levels of nitrogen compounds in the effluent (YOO et al., 1999; Ruiz et al., 2006). Because the partial nitrification process requires nitrite accumulation, the second step must be restrained so as to accumulate ammonia oxidizing bacteria (AOB) and wash out nitrite oxidizing bacteria (NOB). 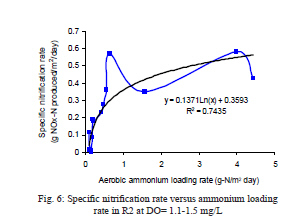 According to the results, nitrification rate (under condition of partial nitrification) showed a strong logarithmic curve correlation to the ammonium loading rate in the aerobic reactor (R2=0.74) under DO=1 to 1.5 mg/L. As indicated, nitrification rate has increased with increasing ammonium loading. But increasing rate of nitrification in the higher ammonium loading rate has decreased (DO aerobic reactor = 1.1-1.5 mg/L). It can be expressed that ammonium ions are converted to nitrite ions at a faster rate than nitrite ions are converted to nitrate ions. Therefore, excessive ammonium ion discharge or deamination of organic-nitrogen compounds may inhibit nitriﬁcation (Gerardi, 2002). In addition, deterioration of nitrogen removal efficiency was mainly due to ammonia accumulation. A possible reason for deterioration of the nitrogen removal efficiency would be an increase in free ammonia (FA) and free nitrous acid (FNA). FA is inhibitory to AOB and NOB, and FNA rather than NH4+, and NO2, is inhibitory to only NOB (Terada et al., 2003). Normally, the aerobic reactor (R2) had very low heterotrophic activity and significantly higher nitrification rates. It may be assumed that the aerobic reactor (R2) had a biofilm with a thinner layer of heterotrophs and a significantly higher density of nitrifiers. So, excellent NH4-N conversion was obtained at overall loads 3.9 of gNH4-N/m2day. If nitrification rate is calculated as g NOx-N/m2day, the maximum and average values are 0.58 and 0.23 g NOx-N/m2day, respictively. Rusten et al. (1995) reported maximum nitrification rates (1.4 to 1.6g N/m2day) in a wastewater treatment plant with complete nitrification and post-denitrification (8.0-15.6°C). According to the results, ammonium removal rate (under low DO concentration=1-1.5 mg/L) showed a straight line correlation to the ammonium loading rate in the aerobic reactor (R2=0.996). 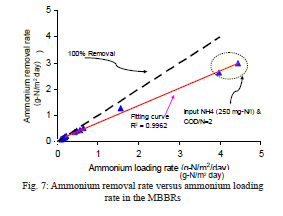 As indicated, ammonium removal rate has decreased with increasing ammonium loading rate. The results suggest that the nitrification was inhibited by substrate (ammonium) concentration. In other words, increasing ammonium loading rate (4.43g-N/m2day) (COD/N=2)) removal efficiency was decreased (average removal efficiency reached by 66.9%) under the conditions of (COD=500 mg/L, IR=3:1, DO=1-1.5 mg/L, HRT=20 h and temprature=28.5±1oC). 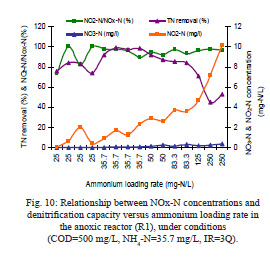 Whereas, ammonium removal rate has increased with increasing ammonium loading rate from 0.11 to 0.22 g-N/m2day and it demonstrated close to complete NH4+-N removal efficiency (above 96%) in aerobic reactor in the same conditions. It may be assumed that the dissolved oxygen concentration at higher ammonium loading rates reﬂected that the stagnation of ammonium removal was attributed to need higher dissolved oxygen concentration in the aerobic reactor. This could be explained by the following hints; because the organic carbon present in the wastewater is quite limited, the complete removal of nitrogen from the wastewaters that contain a high nitrogen concentration (> 2.5 g N/m2d) requires a large amount of an added carbon source for denitrification. Research by (Van Dongen et al., 2002) has shown and confirmed this result. In addition, higher nitrogen loading rate and low DO concentrations would result in: (i) total ammonia nitrogen (TAN) accumulation in the reactors, (ii) (AOB) and (NOB) inhibitions by free ammonia (FA) and (iii) incapacity of the system to oxidize this load, resulting in high TAN concentration in the efﬂuent. Jubany et al. (2009) also had to hint the reasons. Yoo and et al. (1999) reported that under optimum conditions nitrogen removal efficiency reached about 90%. It can be expressed that ammonium ions are converted to nitrite ions at a faster rate than nitrite ions are converted to nitrate ions. Therefore excessive ammonium ion discharge or deamination of organic-nitrogen compounds may inhibit nitriﬁcation (Gerardi, 2002). Results Fig. 8 showed that there was significant (p<0.05) correlation between the denitrification rates to NOx-N loading rate in the anoxic reactor. This indicated that the denitrification rate in anoxic reactor followed the NOx-N loading rate and followed the zero-order reaction kinetics. According to this result, the denitrification rate may be limited by the nitrate concentration, the biodegradable organic matter concentration or by the oxygen concentration (or rather the presence of oxygen). If oxygen is supplied to the reactor with the inlet wastewater or recirculated wastewater, biodegradable organic matter will be consumed for oxygen respiration and thus reduce the available amount for denitrification. Nitrification is a prerequisite for denitrification. An attached-biomass reactors with Kaldnes (k1) as the bioﬁlm carrier was operated until an average biomass content in of 2.35 and 2.95 kg VSS/m3 of reactor volume the anoxic (R1) and the aerobic (R2) reactors was achieved, respectively. According to Fig. 9, SDNR rate had a strong correlation to SNR in the aerobic reactor under low DO concentration (DO=1-1.5 mg/L) (R2=0.874). These results showed that there was significant (p<0.05) correlation between SDNR and NOx-N loading rate. This indicated that the specific denitrification rates in R1 followed the zero-order reaction kinetics and the performance of pre-denitrification process without external carbon source and returned sludge in the MBBRs system was suitable because the average attached biomass concentration in the anoxic and aerobic reactor was relatively high (2350-2950 g VSS/m3). According to Fig. 9, SDNR in the anoxic reactor was more than that for SNR in the aerobic reactor. The reasons are that:1) the biomass (biofilm) concentration in the aerobic reactor was more than that for the anoxic reactor and 2) to characterize denitrification, a nitrogen mass balance and internal recycle ratio from R2 to R1 on each overall system was performed. Denitrificatioin is generally a facultative trait and is carried out by a variety of respiratory bacteria that can utilize oxidized nitrogen compound (instead of oxygen) as the electron acceptor (Mara and Horan, 2003). Virtually, all bacteria that are able to reduce nitrate are also able to reduce nitrite. Thus, for simplicity, sometimes a single group of denitrification capable of both nitrite and nitrate reduction is assumed. In addition, molecular oxygen has been shown to repress the enzymes responsible for denitrification (Mara and Horan, 2003). In the presence of oxygen, the denitrification reaction is inhibited and the denitrifying bacteria switch to using oxygen as their terminal electron acceptor. Andreottola et al (2000) observed an average nitrification rate as 44.16 g NO3-N/kg VSS/day. Three factors, the load of organic matter, the ammonium concentration and the oxygen concentration, primarily determine the nitrification rate. Organic load controls nitrification and should be as low as possible. Nitrification rates will depend on the mixture and distribution heterotrophs and nitrifiers within the biofilm and the oxygen penetration into the biofilm (Rusten et al, 1995). According to Fig. 10, the high loading rate of nitrogen had strongly affected the nitrate and nitrite ions in R1 and limited denirtification was achieved in the anoxic reactor. Because heterotrophic microorganisms use organic matter as carbon and energy source whereas COD or organic matter relation to NOx concentration was low in this reactor. Therefore, at high influent COD, complete denitrification (COD/N ≥ 14; TN removal efficiency > 99%) was achieved in the anoxic reactor (R1) and at low influent COD loading or high nitrogen loading rate resulted in incomplete denitrification and higher effluent total inorganic nitrogen concentrations. Ruiz et al. (2006) and Antileo et al. (2006) reported that during the steady state, the mean value of nitrite accumulation were 73.8±6.2% and 84-88%, respectively. Ultimately, the results indicated that the lab-scale MBBR system under partial nitrification/denitrification has acceptable performance for removal of nitrogen and COD. Park et al. (2000) reported that formation of nitrous oxide is more prone under lower DO 0.2–0.5 mg/L during nitriﬁcation. Nitrous oxide has a relatively high toxicity for microorganisms. In addition, N2O is a potent green-house gas, whose activity is 200–300 times greater than that of carbon dioxide (CO2). During partial nitriﬁcation, it could be formed through three possible ways. The ﬁrst could be the oxidation of hydroxylamine over nitriﬁcation (Goreau et al, 1980). The Second is the possible reduction of accumulated nitrite to nitrous oxide in anoxic zones inside the bio-carriers. The third possibility could be during the denitriﬁcation in the anoxic region (Wrage et al, 2001), as a small amount of nitrate is also produced during the process of partial nitriﬁcation. It is commonly agreed that low oxygen concentration and high NO2-N concentration favor greater emission of N2O. According to Fig. 12, the lab-scale MBBR system was a very effective process for close to complete organics and nitrogens removal, with average SCOD, TN and ammonium removal efficiencies of 99.4%, 98.24% and 99.75%, respectively, during optimum conditions. Yoo et al. (1999) also reported SCOD and TN removal efficiency up to 95% and 90%, respectively. 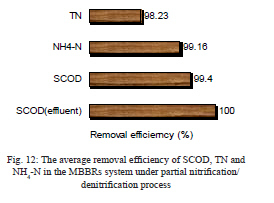 Kermani et al, (2008) reported SCOD and TN removal efficiency on a lab-scale with complete nitrification and pre-denitrification as 96.9% and 84.6%, respectively. In the Kaldnes MBBRs system at partial nitrification–denitrification process the reduction of nitrite to nitrogen gas requires 40% less carbon source (Henze et al., 2008). Moreover, since the nitrite is consumed by the nitriﬁcation and formed again during denitriﬁcation, the nitrite oxidation becomes an unnecessary step (Antilo et al., 2006). Thereby, TN removal rate under partial nitriﬁcation and pre-denitrification is closely complete and shortcut biological nitrogen removal is obtained. This process can signiﬁcantly enhance the economy of the treatment process by reducing the amount organic matter needed for the denitrification step, decreasing the aeration requirements during nitrification, eliminating sludge recycle and reducing surplus sludge generation (Chung and Bae, 2002). Contrary to the activated sludge reactor, Kaldnes MBBR process does not need any sludge recycle because this is achieved by having the biomass growing on carriers that move freely in the wastewater volume of the reactor and that are kept within the reactor volume by a sieve arrangement at the reactor outlet (Rusten et al, 2006). In addition, whether or not a biofilm will develop in a MBBR system will depend on the washout of suspended biomass. If the rate of washout of suspended bacteria is larger than the growth rate of a particular group of organisms, then these organisms will preferentially grow in a biofilm (Henze et al, 2008). Overally, it may be suggested that the partial nitrification-denitrification process (pre-denitrification) in the MBBRs system could be used as an ideal and efficient option for the total nutrient removal from municipal and industrial wastewater. 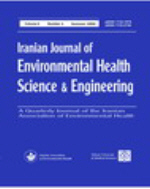 The authors would like to express their thanks to the laboratory staff of the Department of Environmental Health Engineering, School of Public Health, for their collaboration and also to the research administration of Isfahan University of Medical Sciences for the financial and administrative supports under grant Number 387257. The authors also gratefully acknowledge the contribution of Mr. Farrokhzadeh for his work to build the lab-scale MBBR system. This manuscript was extracted from corresponding author Ph.D. thesis. Abeling, U., and Seyfried, C.F., (1992). Anaerobic-aerobic treatment of high strength ammonium wastewater nitrogen removal via nitrite.Water Sci Technol., 26:1007-15. Andreottola, G., Foladori, P., Ragazzi, M., (2000). Up grading of a small wastewater treatment plant in a cold climate region using a moving bed bioﬁlm reactor (MBBR) system. Water Sci and Tech., 41(1): 177–185. Antilo, C., Werner, A., Ciudad, G., Munoz, C., Bornhardt, C., Jeison, D., Urrutia, H., (2006). Novel operational strategy for partial nitrification to nitrite in a sequencing batch rotating disk reactor. J. Biochem. Eng., 32: 69-78. Bernet, N., Dangcong, P., Delgenes, J.P., Moletta, R., (2001). Nitrification at low oxygen concentration in biofilm reactor. J. Envir. Eng, ASCE., 127:266-271. Chung, J.,and Bae, W., (2002). Nitrite reduction by a mixed culture under conditions relevant to shortcut biological nitrogen removal. Biodegradation., 13: 163-170. Ciudada, G., Rubilar, O., Munoz, P., Ruiz, G., Chamy, R., Vergara, C., Jeison, D., (2005). Partial nitriﬁcation of high ammonia concentration wastewater as a part of a shortcut biological nitrogen removal process. Process Biochemistry., 40: 1715–19. Delenfort, E., and Thulin, P., (1997). The use of Kaldnes suspended carrier process in treatment of wastewaters from the forest industry. Wat.Sci.Tech., 35(2-3):123-130. Dulkadiroglu, H., Cokgor, E.U., Artan, N., Orhon, D., (2005).The effect of temperature and sludge age on COD removal and nitrification in a moving bed sequencing batch biofilm reactor.Water Sci. Technol., 51: 95-103. Gerardi, M.H., (2002). Nitriﬁcation and Denitriﬁcation in the Activated Sludge Process. John Wiley and Sons, Inc., New York., 120-122. Goreau, T. J., Kalpan, W. A., Wofsy, S. W., McElroy, M. B., Valois, F. W., Watson, S. W., (1980). Production of No2 and N2O by nitrifying bacteria at reduced concentrations of oxygen. Appl. Environ. Microbiol. 40 (3):526-53. Helness, H., (2007). Biological phosphorus removal in a moving bed biofilm reactor. Doctoral theses at Norwegian University of Science and Technology (NTNU) Printed by NTNU-trykk., pp.177. Hem, L.J., Rusten, B., Ødegaard, H., (1994). Nitrification in a moving bed biofilm reactor. Water Sci. Technol., 28: 1425-1433. Jahren, S., Rintala, J.A., Ødegaard, H., (2002). Aerobic moving bed bioﬁlm reactor treating thermomechanical pulping whitewater under thermophilic conditions. Water Res., 36: 1067–1075. Jubany, I., Lafuente, J., Carrera, J., Baeza, J.A., (2009). Automated thresholding method (ATM) for biomass fraction determination using FISH and confocal microscopy. J. Chem.Technol. Biotechnol. 84 :1140-1145. Kermani, M., Bina, B., Movahedian, H., Amin, M.M., Nikaein, M., (2008). Application of Moving Bed Biofilm Process for Biological Organics and Nutrients Removal from Municipal Wastewater. Am. J. Environ. Sci., 4(6): 682-689. Mara, D., Horan, N., (2003). The handbook of water and wastewater microbiology. 1st edition, An imprint of Elsevier, London, UK. Maurer, M., Fux, C., Graff, M., Siegrist, H., (2000). Moving bed biological treatment (MBBT) of municipal wastewater: denitrification. Water Sci. & Tech., 43(4-5): 337-344. Odegaard, H., Rusten, B., Swestrum, T., (1994). A new moving bed biofilm reactor – applications and results. Wat. Sci. Tech., 29(10-11):157-165. Rittmann, B.E., and McCarty, P.L., (2001). Environmental biotechnology: principles and applications. McGraw-Hill, New York: 470-4. Ruiz, G., Jeison, D., Chamy, R., (2003). Nitrification with high nitrite accumulation fore the treatment of wastewater with high ammonia concentration. Water Res., 37(6): 1371-1377. Ruiz, G., Jeison, D., Rubilar, O., Ciudad, G., Chamy, R., (2006). Nitrification-denitrification via nitrite accumulation for nitrogen removal from wastewaters. Bioresource Technology., 97:330-335. Rusten, B., Eikebrokk, B., Ulgenes, Y., (2006). Design and operations of the kaldnes moving bed biofilm reactors. Aquacultural Engineering., 34(3):322-331. Rusten, B., Hem, L., Ødegaard, H., (1995). Nitrification of municipal wastewater in novel moving bed biofilm reactors. Water Environ. Res., 67: 75-86. Strous, M., Heijnen, J.J., Kuenen, J.G., Jetten, M.S.M., (1998). The Sequencing Batch Reactor as a powerful tool for the study of slowly growing anaerobic ammonia-oxidizing microorganisms. Appl. Microbiol. Biotechnol., 50 : 589–596. Tchobanoglous, G., Burton, F. L., Stensel, H. D., (2003). Wastewater engineering: treatment and reuse. 4th Edition., McGraw Hill, New York. Terada, A., Hibiya, K., Nagai, J., Tsuneda, S., Hirata, A., (2003). Nitrogen Removal Characteristics and Biofilm Analysis of a Membrane-Aerated Biofilm Reactor Applicable to High-Strength Nitrogenous Wastewater Treatment. Journal of Biosci and Bioeng., 95(2):170-178. Turk, O., and Mavinic, D.S., (1987). Selective inhibition: a novel concept for removing nitrogen from highly nitrogenous wastes. Environ Technol Lett., 8:419-26.
van Dongen, U., Jetten, M.S.M., van Loosdrecht, M.C.M.,(2002). The SHARON-ANAMMOX process for treatment of ammonium rich wastewater. Wat. Sci. Technol. 44 :153– 160. Wang, J., and Yang, N., (2004). Partial nitrification under limited dissolved oxygen conditions. Process Biochemistry., 39:1223-1229. Wrage, N., Velthof, G. L., Van Beusichem, M. L., Oenema, O., (2001). Role of nitrifier denitrification in the production of nitrous oxide. Soil Biol. Biochem. s(12):1723-1732. Xiao, L.W., Rodgers, M., Mulqueen, J., (2007). Organic carbon and nitrogen removal from a strong wastewater using a denitrifying suspended growth reactor and a horizontal-flow biofilm reactor. Bioresource Technology., 98: 739–744. Yoo, H., Ahn, K.H., Lee, H.J., Lee, K.H., Kwak, Y.J., Song, K.G., (1999). Nitrogen Removal from Synthetic Wastewater by Simultaneous Nitrification and Denitrification (SND) via Nitrite in an Intermittently-Aerated reactor. Water. Res., 33(1):145–154.